The Taniwha enduro model is designed as a complete system that aims to up the ante on long travel trail bike performance and change the way riders look at bike maintenance. Building on a heritage of DH racing success, Zerode founder Rob Metz combines modern geometry and cutting edge carbon manufacturing with the proven benefits of a gearbox to create a better riding experience. With a high quality gearbox from German brand Pinion, the bike has a massive gear range inside a sealed package that is nearly maintenance-free and offers dramatically improved ground clearance when the trails get rough and rowdy. Shifting is super-fast and seamless across the gear range whether pedalling or coasting. A simple, effective, and proven suspension platform combined with a fixed chain line optimizes pedaling performance through the entire travel range. The single speed rear hub and lack of derailleur, minimizes unsprung weight to further improve suspension performance, and the symmetrical spoke angle ensures superb rear wheel stiffness. Endless pummeling down sharp rocks and roots. Day in, day out, regardless of weather. These local trail conditions set the performance standards for Cane Creek suspension. 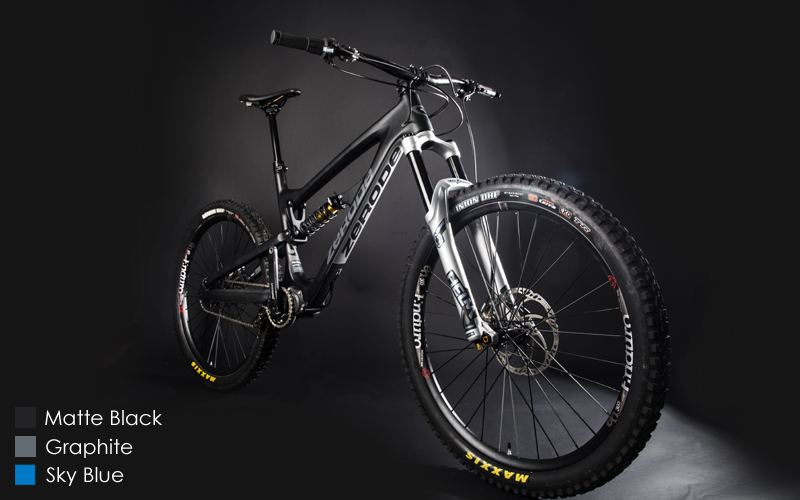 Inspired by North Carolina trails, the Cane Creek Edition Taniwha was born! This fall, we rode with the tight-knit family of pinners that make up Cane Creek in the woods surrounding their headquarters in Fletcher, NC. We loved their trails. They loved our bikes. From these adventures, Cycle Monkey and Cane Creek teamed up to create a special edition Taniwha that showcases Cane Creek’s Helm fork and DB IL shocks. For those who want to take their riding to the next level, Cane Creek's top-level suspension brings our enduro bike to the next level. Build options come with your choice of air or coil suspension and Industry Nine wheels - a local favorite of the Cane Creek crew. 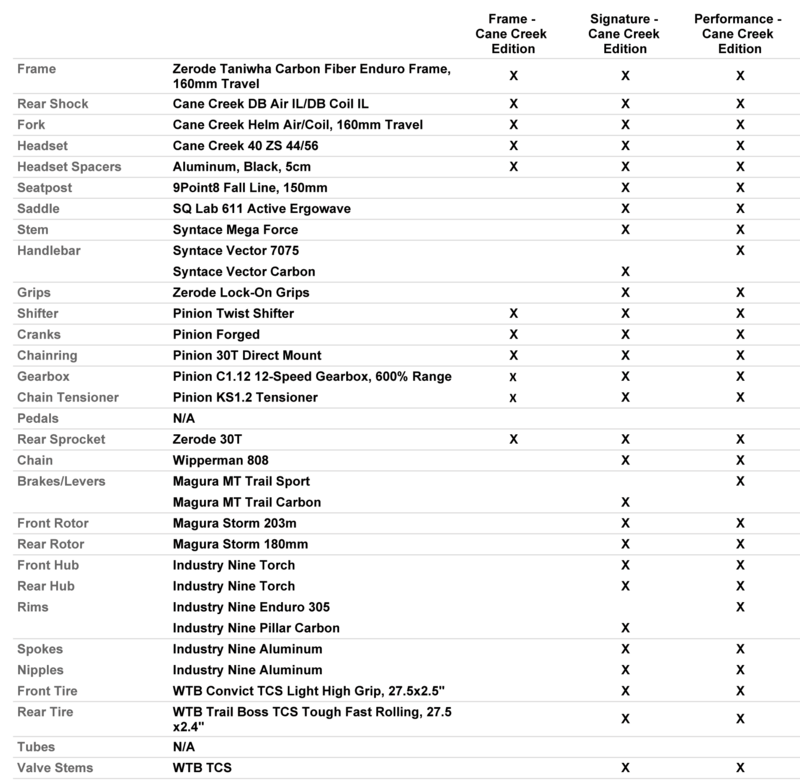 Refer to Build Kit Table below for list of parts for each build kit. Parts shown in images may not match build spec. "Riding down the super irregular rock at Bootleg, the rear end of the Taniwha tracked the ground better than any other bike I’ve ever been on, including full blown DH rigs with perfectly dialed coil shocks." "The Taniwha brings something to the table that’s legitimately different, and in many aspects, legitimately better." "The forward thinking Zerode Taniwha complete with it's smooth changing gearbox is exciting news in the bike industry"
"The Zerode Taniwha has the most impressive rear suspension that I have ridden, crushing trails like no other enduro bike. It feels like the rear wheel never leaves the ground. The resulting grip and composure are unmatched." "For a rider who is constantly looking for the next best thing in mountain bike performance and durability, the Taniwha is immediately intriguing, as it’s a bike that fundamentally seeks to improve the mountain biking experience."